You have heard it before, breakfast is the most important meal of the day but what you need to know is that Denny's does more than breakfast and at a reasonable price. You can find a few of their restaurants right on the Las Vegas strip and if you are looking to save money on food while not having to go far check out some of their easy to get to locations near the center strip. If there is one meal that can be improved upon in Las Vegas it is breakfast. While most hotels have coffee shops and 24-hour cafes, breakfast is often the meal that is weak in a resort's portfolio of dining options. You could attempt an expensive buffet or a bland coffee shop. If you are a true breakfast lover take a look at this list of Breakfast in Las Vegas Ideas find your gem. For those looking for convenience and a very good value, Denny's is a really good option. 3001 Las Vegas Blvd. S.
7200 Las Vegas Blvd. S.
Price Range Denny’s: Less than $20. What it’s like at Denny’s? 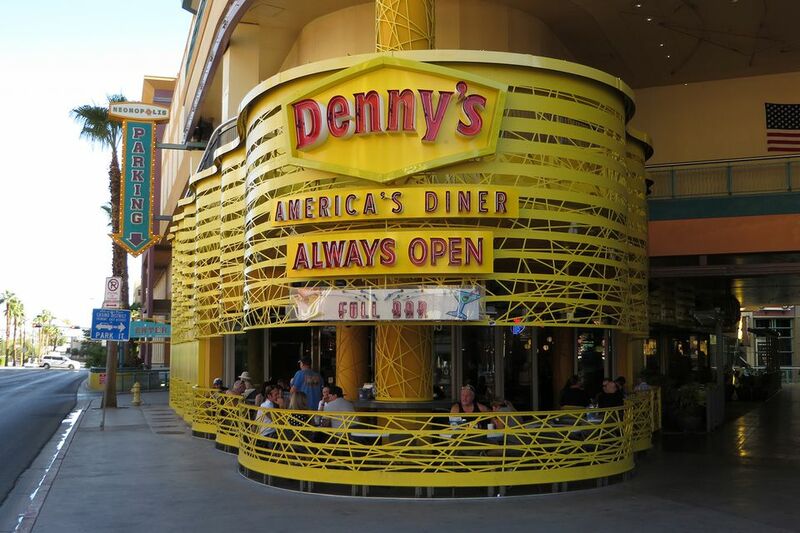 Most of us have been to a Denny’s so there are very few surprises, however, I mention Denny’s as an alternative to casino and hotel eating establishments primarily for the budget minded travelers. Denny’s is a simple, casual, dining room that serves good food at reasonable prices. If you are looking to save a few dollars while in Las Vegas Denny’s might be an option. With locations right on the Las Vegas strip, they are very convenient as well. There is a Denny’s across the street from the Mirage near the Venetian and one very close to Wynn Las Vegas. Each of these is walking distance from most hotels on the Las Vegas strip. How’s the food at Denny’s? My biggest reason for writing about Denny’s is breakfast in Las Vegas is not always easy or cheap if you have kids. If you are traveling with children Denny’s is your best bet for the simple reason that they offer a children's menu. So many hotel coffee shops do not offer the lower prices for children. How many times have you had half of an oversized Belgian waffle go to waste? Now, how many times have you eaten it because you can’t see yourself spending $12 dollars for a waffle that simply could not fit in your child’s stomach? I find that eating at Denny’s saves me, on average, $10 to $15 off a hotel coffee shop bill. That may sound ridiculous but consider those children’s meals at Denny’s usually come with drinks and dessert you can see where the savings come in. No children? It is a toss-up, you will save money but do you want to walk the extra ten minutes for a similar meal?